The Thermaltake Level 10 GT is another BMW-designed chassis, and a response to the very poorly received original Level 10 case. This time around it's very much a more traditional PC design, improving the cooling and sound levels while at the same time knocking a huge chunk off the frankly insane pricetag of the original. That's a win then, right? Straight away, before anyone even thinks about letting so many pounds loose into the wild in exchange for one, we'd have to say wait for the rest of the review. Ignoring price, it's a hard case to recommend. Factoring in the still rather high pricetag makes it risible. Chassis are relatively simple bits of kit in comparison to other PC components, so it's a big ask to get people to spend so much money on a PC part that won't directly affect a PC's performance beyond actually being able to fit the components inside it and provide adequate cooling to those components. Herein lies the Level 10 GT's crucial failings. Not only does it not justify itself as a luxury consumer item with decadent extras, it doesn't even get the fundamentals right. It's a nasty, two-headed serpent of failings. For starters, the GT has done away with the visually arresting, it's-the-futurecome-early modular design of the original Level 10. Most likely because the airflow and subsequent cooling was terrible. The more traditional structure of the GT has undoubtedly improved this issue, but the visual appeal suffers as a result – it looks like any other case now, albeit a case full of huge neon fans. Said fans can be controlled by a button on the top of the case to change from red, green or blue, to a flashing multi-colour mode that brought back hazy memories of cheap wedding receptions. You don't find controllable neon fans on just any case, and in this regard the Level 10 GT retains some appeal to the enthusiast. It's a very cheap mod to do yourself though, and if you mod another case in this way you'll save yourself the nightmare of descending into the labyrinth of cheap plastic that is the Level 10 GT's interior. Once you've used the key to unlock the farcically unnecessary panel lock, you're presented with all manner of flimsy storage bays and airflow directors on fans. If the build quality were higher, we'd be impressed with the hot-swappable drive bays and neat SATA cable management system. But for a case of this price, the build quality's way off. Undeterred? Still hell-bent on investing on a BMW-designed case because it's got its own Flash site and, you know, those neons? How about a front fan that rattles against the tacky plastic front panel lock mechanism? Or the four (count them!) screws you need to remove from the back plate just to install a GPU? Throw in side panels that only close after jigging them about like a second-hand car door, not enough space for admittedly oversize, but serious, enthusiast-class motherboards like the MSI Big Bang Marshall, and ultimately poor interior temperatures, and you've got one hell of a chassis for your £205, mister. There are much, much better chassis on the market for almost half the price – we literally cannot think of a single reason for someone to buy this. 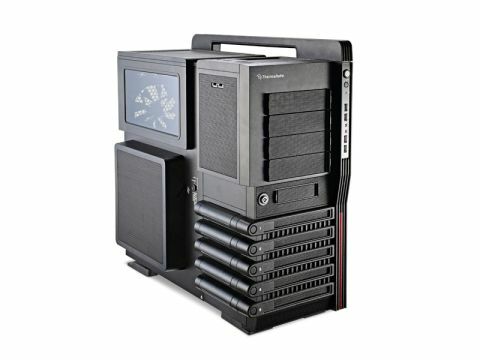 In fact, all Thermaltake's other cases are heaps better than this, which is another reason why the Level 10 GT is such a perplexing anomaly to us.